Use 4 droppers of Blood Support™ (4 mL), 3 times a day–be sure to shake the bottle well before each use. At 12 droppers per day, each bottle of Blood Support® lasts approximately 5 days. Use the following regimen until the bottle is done. For some people who don’t mind the taste of the formula, you can simply just drop it straight into the mouth and follow with water. For those who are not fond of the taste, you can mix with juice. 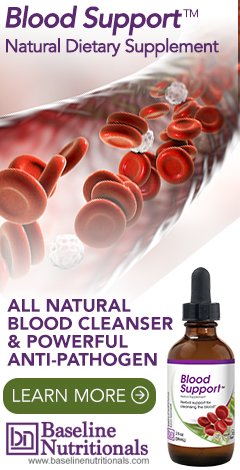 You will be taking 12 droppers worth of the Blood tincture each a day. Each bottle contains about 60 droppers which means you’ll finish one bottle in 5 to 5 ½ days. Note: To get past the taste (very bitter, very hot), Jon recommends adding it to 2 oz of thin, sweet undiluted juice such as apple or grape, downing it in one gulp like a shot of liquor, and then swishing some plain juice in your mouth to clear the taste. (By the way, although normally not a fan of bottled juices, this is one place where they actually work because they are so convenient and because you drink so little at a time.) Thick juices such as peach or orange, on the other hand, tend to coat the mouth, which makes the taste linger — not good. And diluting it simply means you have to drink more, rather than getting it all down in one quick gulp.